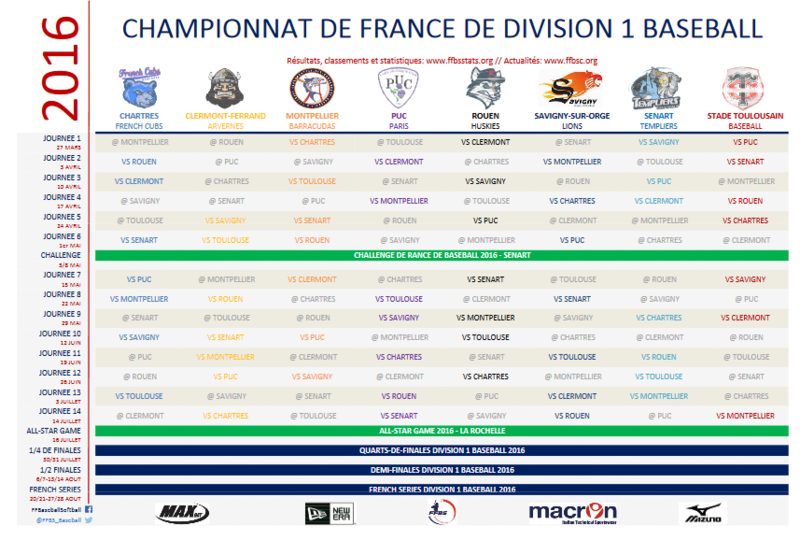 The French Division I is entering the 2016 season on Easter Weekend. Four doubleheaders are scheduled this weekend. Last year the Rouen Huskies returned to the throne, defeating the Montpellier Barracudas 3-1 in the best-of-five finals to claim the title. Once again Rouen is considered the heavy favorite again. However the Templiers Senart and Montpellier Barracudas hope to have a say in the championship race as well. The French Cubs Chartres improved heavily during the winter and could be the surprise. Additionally Stade Toulousain, French record champion Paris UC, the Savigny Lions and the Arvernes Clermont complete the French Division I. Clermont returns to the top league in France. They are replacing the Beaucaire Chevaliers, who got demoted following last year’s campaign. The first game day sees the promoted Arvernes traveling to Rouen, Montpellier hosts the French Cubs, Senart takes on Savigny and Toulouse plays against PUC. All games start on Sunday at 11am.